Seven organizations (NIMS, Kyocera, Osaka University, NEC, Sumitomo Seika, Asahi Kasei and NanoWorld) will jointly establish the MSS Forum on November 1. This forum will encourage participants from the public to carry out experiments demonstrating the performance of ultra-compact MSS (Membrane-type Surface stress Sensor) devices*. This initiative is designed to promote the establishment of a de facto standard for olfactory IoT sensing systems. The MSS is a sensor device developed by an international joint research group led by Genki Yoshikawa (International Center for Materials Nanoarchitectonics (MANA), NIMS) in 2011. The receptor layer coated on a membrane of an MSS absorbs gaseous molecules. Since various organic and inorganic materials can be used as receptor layer materials, the MSS is a highly versatile sensor capable of detecting diverse odorous molecules. The ultra-compact/sensitive MSS is potentially useful in various fields, such as the food industry, environmental assessment, medicine and safety assurance. After its development in 2011, the MSS was subjected to basic research to enhance its odor sensing capability. The MSS Alliance was launched in 2015 to facilitate collaboration between the private sector, academia and national research institutes on R&D related to olfactory IoT sensor system constituent, thereby accelerating the practical application of the MSS. The MSS Alliance has made several notable achievements in R&D related to key constituent technologies. These include the development of sensor devices, receptor layer materials and precise evaluation and data analysis systems. Asahi Kasei, which joined the alliance in April 2017, has been developing receptor layer materials capable of absorbing gaseous molecules and techniques to coat receptor layer materials to an MSS. In addition, companies invited by the alliance carried out more than 10 demonstration experiment projects in which the MSS repeatedly proved to be both highly sensitive to a variety of odors and capable of discriminating between them. In light of these joint research results, we plan to accelerate the practical application of the MSS. We also plan to meet requests we have received from interested groups in different fields for first-hand experience in the use of MSS olfactory IoT sensing systems. Thus, we will launch the MSS Forum on November 1 to encourage interested companies to perform demonstration experiments. The seven organizations that make up the MSS Alliance will continue the R&D on constituent technologies while the companies and research institutes in the MSS Forum promote experiments to demonstrate the effectiveness of the MSS in various environments. Through these efforts, we will pursue the establishment of this sensor technology to achieve a de facto standard. Demonstration experiments to be conducted to validate the capability of the MSS to detect and discriminate between different scents and odors in various fields, such as agriculture, the livestock industry, self-healthcare, construction materials and body odor. The experiments employ standard measurement modules for the MSS developed by the MSS Alliance. 1) Developed and improved reliable sensor devices. 2) Developed new receptor layer materials that react to various target gases. 3) Developed automatic measurement systems capable of accurately evaluating multiple sensor chips under various conditions. 4) Developed electronic circuits capable of processing signals from the sensor and developed control software. 5) Collected basic data on the responses of various receptor layer materials to various target gases. 6) Developed a machine learning engine capable of accurately differentiating data from the MSS and developed a cloud analysis platform. 7) Based on these achievements, more than 10 experimental projects were conducted demonstrating the MSS being highly sensitive to and capable of discriminating between various types of odors. In addition, NanoWorld, a founding member of the MSS Alliance, started selling MSS chips for use in scientific research in April 2016, and the MSS is now used in other fields in advanced research as well. Since the launch in September 2015, many keen players in various fields have contacted the MSS Alliance seeking first-hand experience in the use of MSS olfactory IoT sensing system. Over the last two years, joint research by the private sector, academia and national research institutes has produced significant results, and the partner companies and organizations invited by the alliance carried out more than 10 demonstration experiment projects. 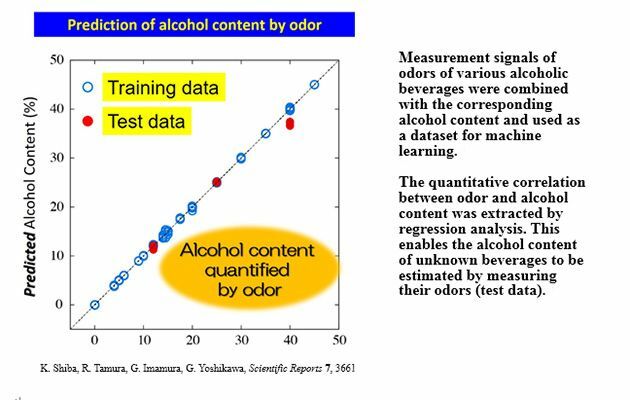 These activities validated the MSS's high degree of sensitivity and ability to discriminate between various types of odors. As the next step, a new system has been organized to enable participations from public to perform demonstration experiments in their own environments. Objective: With potential candidates from the public, to carry out experiments to demonstrate the performance of the MSS olfactory IoT sensing systems, thereby accelerating to achieve a de facto standard. Participants can use standard measurement modules for the MSS. Participants will be provided with technical instructions and a data collection environment usable locally. A cloud artificial intelligence (AI) analysis platform is available for participants to analyze collected data. Participants can carry out validation experiments using their own organizations' measurement and analytical resources. Please note that participants are required to submit simple reports on their validation experiment results. ・Announcement of application outlines - mid October, 2017 - Information will be available. ・First application period begins - November 1, 2017 - About 10 organizations will be accepted (after screening*). ・Second application period - February 2018 or later - The number of organizations to be accepted is yet to be determined. We will examine whether participants possess appropriate engineering resources. The MSS Forum will conduct validation experiments in various fields to identify further issues for commercialization and to deepen and accelerate R&D for solutions to these issues. In addition, it aims to create components/modules and solutions that enable each of the constituent technologies of the MSS olfactory IoT sensing systems to be more easily utilized in product concepts of people in industry and carry out basic technology R&D including the provision of measurement, analysis and databases services. 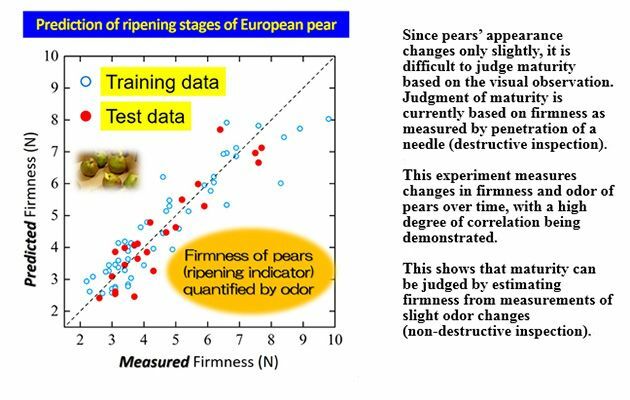 Through these activities, technological R&D is further accelerated to gain acceptance of the MSS olfactory IoT sensing system ("Standard Scent and Odor Measurement Tool") as a de facto standard tool for measurement of scent and odor, facilitating its implementation for society. Note: What is an MSS (Membrane-type Surface stress Sensor)? Developed by NIMS group leader Genki Yoshikawa et al, the MSS is a groundbreaking sensor device that is ultra-compact and sensitive to odors. When molecules adsorb on the receptor layer of the MSS, stress induced in the receptor layer causes electrical resistance change in the detection parts, enabling target molecules to be measured (see the diagrams below). Capable of detecting trace amounts of various substances in the air or liquids with high sensitivity, the MSS has potential for application in a wide range of fields such as medicine, food industry, environmental assessment and safety assurance. Schematics of the MSS. When the receptor layer coated on the center membrane of the sensor absorbs molecules, induced surface stress is detected by piezoresistors embedded on four narrow beams around the membrane.